In this paper, I will give a presentation of Bradley's two main arguments against the reality of relations. Whereas one of his arguments is highly specific to Bradley's metaphysical background, his famous regress argument seems to pose a serious threat not only for ontological pluralism, but especially for states of affairs as an ontological category. Amongst the proponents of states-of-affairs ontologies two groups can be distinguished: One group holds states of affairs to be complexes consisting of their particular and universal constituents alone, the other holds that there has to be a "unifying relation" of some sort to establish the unity of a given state of affairs. Bradley's regress is often conceived to be a compelling argument against the first and for the latter. I will argue that the latter approaches have no real advantage over the simpler theories—neither in the light of Bradley's regress nor in other respects. Abaelardus, P. (1970). Dialectica, van Gorcum & Comp, Assen. Armstrong, D. M. (1989a). A Combinatorial Theory of Possibility, Cambridge University Press, Cambridge. Armstrong, D. M. (1989b). Universals. An Opinionated Introduction, West-view, London, Boulder (Colorado). Armstrong, D. M. (1997). A World of States of Affairs, Cambridge University Press, Cambridge. Armstrong, D. M. (2004). 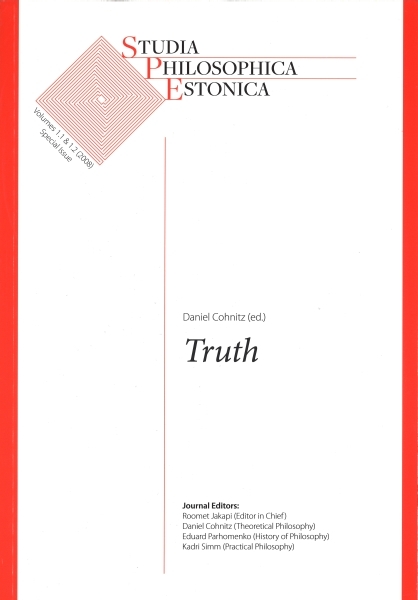 Truth and Truthmakers, Cambridge University Press, Cambridge. Bradley, F. H. (1897). Appearance and Reality-A Metaphysical Essay, Vol. 9 of Collected Works, 2nd edn, Thoemmes Press, Bristol, Sterling (Virginia). Bradley, F. H.(1910). On appearance, error and contradiction, Mind 19:153-185. Bradley, F. H. (1911). Reply to Mr. Russell’s explanations, Mind 20: 74-76. Broad, C. D. (1933). An Examination of McTaggart’s Philosophy, Cambridge University Press, Cambridge. Collingwood, R. G. (1970). An Autobiography, Oxford University Press, London. Frege, G. (1892). Über Begriff und Gegenstand, Viertel jahrsschrift für wissenschaftliche Philosophie 16: 192-205. Körner, S. (1968). Discussion: On Bergmann’s ontology, Philosophy of Science 35/1: 64-71. Lewis, D. (1992). Critical notice of Armstrong, D.M., A Combinatorial Theory of Possibility, Australasian Journal of Philosophy 70/2: 211-224. Russell, B. (1910). Some explanations in reply to Mr. Bradley, Mind 19: 373-378. Russell, B. (1989). The philosophy of logical atomism, in B. Russell (ed. ), Logic and Knowledge-Essays 1901-195 Unwin Hyman, pp. 177-281. Russell, B. (1996). The Principles of Mathematics, W. W. Norton, New York, London. Strawson, P. F. (1990). Individuals, Routledge, London. Vallicella, W. F. (2002). Relations, monism, and the vindication of Bradley’s Regress, Dialectica 56: 3-36. Whitehead, A.N. and Russell, B. (1962). Principia Mathematica to *5 Cambridge University Press, Cambridge. Wittgenstein, L. (1974). Tractatus Logico-Philosophicus, Routledge and Kegan Paul, London. Trans. C. K. Ogden.